Tales of the miraculous deeds performed by the Rebbe and his predecessors are passed down through the generations by word of mouth. Chassidim draw on these tales for encouragement and inspiration, and come away charged with even greater devotion to their teachers. The stories recounted in this chapter were told first-hand, and constitute but a small fraction of the Chassidic legacy. Find­ing a rational explanation for these narratives is impossible. Chassidim will tell you that the Rebbe is an extraordinary person, and that the Almighty Himself speaks through his lips and directs his actions. People who do not believe in supernatural, divinely inspired powers can only wonder at these stories and spread their hands in a gesture of helpless­ness and inability to find a satisfactory explanation. In the Davydov family in Jerusalem, the tension is palpable. The seventy-six year old father of the family is in the hospital, diagnosed with cardiac failure. Bustling doc­tors surround his bed. According to them, there is no hope for recovery: "His days are numbered." The Davydov fam­ily summons top Israeli physicians~ they invite some medi­cal luminary from London. After every possible test and analysis, the doctors unanimously agree: the only chance of saving the patient is immediate surgery. The family members ask, "Will the surgery save him?" The doctors reply, "The chance is slim, but it is his only chance. The patient must be readied for surgery at once." "Wait a minute," says Eitan, one of the man's five sons. "We must ask the Rebbe." "There is no time for idle questions," the doctors object. "Time is running out, every minute counts." "This will not take long," says Eitan. The doctors sigh. Eitan ignores them. A few minutes later, he returns. "We left a message with the Rebbe's office. We will wait for the answer." The head surgeon tries to control himself, but his face shows that he is losing his patience. "How long are you going to wait?" he asks. "I don't know," answers Eitan. "As long as it takes." Here the doctors' pa­tience comes to an end. "Don't you realize that you are playing with your father's life?" They try to coerce the fam­ily. "How can we assume responsibility for the patient's condition when a Rebbe from New York makes our deci­sions for us?" The tension is at the breaking point. The mother begs, "Let's give our consent to the operation." Two of the sons begin to waver, but Eitan is adamant. "We will wait," he insists. Finally the answer arrives. "The Rebbe thinks that surgery is out of the question. It is too dangerous. The pa­tient will recover in a few days." The doctors are outraged. "Well, it's your decision!" they say. Only one of them is unable to restrain himself, "You are out of your mind! Your Rebbe is sitting in New York, and he is supposed to decide the fate of a patient whom he has never even seen? I don't know what your Rebbe has told you, but I think you are all mad!" The family members heard him out and stuck to their decision. The Davydovs, Jews from Bukhara, are not Chabadniks. However, since establishing a connection with the Rebbe, they do not take a single important step in their lives without consulting him first. They were troubled by what the doctors had told them, but there was nothing to be done. The doctors went back to their work, while the family re­mained at the unconscious patient's bedside. All they could do was sit and wait for the Rebbe's prediction to come true. From time to time, the doctors would pass by the bed and shake their heads in dismay. They saw no hope for recovery. Four days later, Issachar Davydov opened his eyes and asked for a glass of water, sounding like any ordinary, tired person asking for a small favor. Then it turned out that he was hungry as well, and food was brought to him. A few more days went by, and Issachar returned to his home in Je­rusalem. He resumed his regular routine of getting up at five in the morning, taking a few kilometer walk to the Wailing Wall, saying the morning prayers, and coming back home for breakfast. He is now over eighty, yet he maintains the same daily routine. It is easy to guess the feelings that fill his children's hearts to overflowing. In remote Russia, a girl by the name of Rivka became gravely ill with muscular dystrophy, a progressive, debilitat­ing, and practically incurable disease. The patient gradually loses control over his muscles, eventually succumbing to total paralysis. Researchers are still in the dark as to the mechanism by which this disease chooses its victims. In desperation, the girl's parents consulted top physi­cians, but none of them had encouraging news. For years the girl underwent treatments in various medical institutions, but to no avail. The disease was taking its course. "Do not worry. The girl will recover." "Recover?" The doc­tor smiled when told about the Rebbe's reply. "I have never seen this happen in my entire practice. If I were you, I would not harbor any illusions. I feel that it is time for you to know the real situation. I hate to disillusion you, but the truth must be told. Believe me, the girl's condition is hope­less." Indeed, the patient's condition continued to deterio­rate. Eventually, the despairing parents took the girl home and began to wait and pray for the Rebbe's prophecy to come true. What happened next cannot be viewed as any­thing but a miracle. The girl, who was nineteen by that time, suddenly got up and started walking. In the space of a single day - in fact a single instant - the disease retreated and van­ished without a trace. To this day, Rivka is a happy and healthy young woman. For many years, Mrs. G. from Antwerp suffered from obesity, which led to serious complications. One of her friends advised her to undergo surgery to shorten her intes­tine. That way, explained the friend, she would easily and quickly lose a great deal of weight. Mrs. G., who would never take an important step without consulting the Rebbe, wrote him a letter describing the situation in detail. After several months had gone by without a reply, Mrs. G. wrote another letter. Once again, it went unanswered. Mrs. G. was very surprised. What was wrong? After all, until then the Rebbe had always answered her letters, yet now, when she needed his advice so badly, he seemed to have forgotten her! In the meantime, giving up on receiving an answer from the Rebbe, Mrs. G. decided to forego the surgery and went on a stringent diet instead. Within several months, she lost twenty kilograms, and the question of surgery became irrelevant. Several years later, when Mrs. G. visited the Rebbe, their conversation began in a most unexpected way. "So," said the Rebbe as soon as she walked into his office, "you have managed to lose weight without dangerous surgery." At first Mrs. G. did not even know what he was referring to. It took several minutes for the Rebbe's words to finally sink in! As we have said, these are but a few examples out of the hundreds of stories we have heard. They defy any ra­tional explanation, yet this does not make them any less fac­tual. The following four stories illustrate the inconceivable power of the Rebbe's blessing. Rabbi Moshe Chaim Greenwald tells the first story. My father, Rabbi Abraham Tzvi Greenwald, was born in Lodz in 1912. When he was eight years old, his father passed away, and his mother was left to care for seven small children. My father was the eldest; his mother, anxious to provide him with a proper Jewish education, sent him to live with her cousin, Rabbi Menachem Zemba. A famous Torah sage, Rabbi Menachem devoted a great deal of time to studying Torah with my father. In 1929 the "Great Wedding" took place in Warsaw: Chaya Mushka, the daughter of the sixth Lubavitcher Rebbe, Rabbi Yosef Yitzchak, was marrying Rabbi Men­achem Mendel Schneerson, the future Lubavitcher Rebbe. My father, who was almost seventeen at the time, had the privilege of attending the wedding, which he referred to as a "powerful spiritual charge," since the greatest Chassidic leaders in Poland were present at the event. On the morning after the wedding he had the honor of meeting the groom in person. Rabbi Menachem Zemba, my father's uncle and mentor, told him that he was going to visit the groom, and that his nephew was welcome to join him if he wished. Naturally, my father agreed. He does not remember the conversation that took place between these two great Torah scholars, but the end of their meeting re­mained etched in his memory. Before ending the conversa­tion, Rabbi Menachem Mendel turned to my father and said, "In a few days, it will be Chanukah. Do you know why many Chassidic synagogues celebrate the fifth night of Chanukah as a special occasion?" Rabbi Zemba didn't know, so Rabbi Schneerson ex­plained. "The fifth night of Chanukah never falls on Shab­bat, a fact that symbolizes great spiritual darkness. How­ever, the light of the fifth Chanukah candle is capable of banishing all darkness. The duty of every Jew, wherever he may be - whether in Warsaw or in London - is to 'shed his light' even in the deepest darkness." After that, my father and Rabbi Zemba said goodbye to Rabbi Schneerson and left the hotel. Ten years passed. In 1939, when the Second World War broke out, my father lived through all the horrors of the Holocaust. His wife and five little children were murdered before his very eyes. He himself survived the death camps only by the mercy of the Almighty. The experience left him a broken man spiritually and physically. After the war, my father spent about two years in camps for displaced persons, trying to locate surviving relatives, until it became clear that they had all perished. In 1948, my father immigrated to Philadelphia. His uncle, Rabbi Moshe Chaim Greenwald, who had left for America before my father was born, welcomed him with open arms, and did everything possible to ease his anguish. Time passed, dulling the pain somewhat. My father realized that he could not continue living in the past, and it was time to start a new life. He met my mother in Toronto, where they decided to marry. Prior to the wedding, my fa­ther went to New York for a blessing from Rabbi Yosef Yitzchak, the sixth Lubavitcher Rebbe. The years of suffering had left their imprint on Rabbi Yosef Yitzchak. He was ill and had difficulty speaking as a result of a stroke. One of the Chassidic elders had to explain what the Rebbe was saying. When the Rebbe was told that my father had survived the war and the Holocaust, but had lost his entire family, the Rebbe wept, blessed my father, and wished him a long and happy life. Before he left, my father mentioned that he had had the privilege of attending the wedding of the Rebbe's daughter in Warsaw twenty years earlier. The Rebbe's eyes brightened. "In that case," he said to my father, "you should pay a visit to my son-in-law, Menachem Mendel. His study is one floor down." My father went downstairs and knocked on the study door. Rabbi Menachem Mendel recognized him at once, de­spite the twenty years that had passed since their first meet­ing. He asked my father a question about the fate of his un­cle, Rabbi Menachem Zemba; he knew that father's uncle had perished in the Warsaw ghetto, but he wanted to hear the details. After my father told him all he knew, Rabbi Menachem Mendel said, "Since my father-in-law sent you to me, I have to share words of Torah with you. It is now the month of Kislev. Chanukah is drawing closer. In many Chassidic synagogues, the fifth night of Chanukah is cele­brated as a special holiday. You see, the fact that the fifth night of Chanukah never falls on Shabbat symbolizes great spiritual darkness. The light of the fifth Chanukah candle is capable of banishing any darkness. The duty of every Jew, wherever he may be - whether in New York or London - is to 'shed his light' even in the deepest darkness." My father was astounded: the Rebbe had repeated, virtually word for word, what he had told him during their first meeting twenty years earlier! After his marriage, my father worked for some time as rabbi and teacher at the Adat Israel synagogue in Wash­ington Heights. After my sister and I were born, our family moved to Toronto, where the leadership of the local Chassi­dic community invited my father to assume a position as rabbi and teacher. My wedding was to take place in the winter of 1969. Even though our family was not Lubavitch, my father sug­gested that I should definitely visit the Lubavitcher Rebbe before the wedding to receive his blessing, as my father had done in his time. I gladly agreed. However, arranging a visit with the Rebbe was far from an easy matter. My father contacted the Rebbe's secre­tary by phone, and explained that we could not wait for sev­eral months. Eventually, the secretary agreed to let us come without waiting our turn, but on one condition: only a bless­ing, and no discussions! I do not recall the exact time when we entered the Rebbe's study. I do remember that it was in the early hours of the morning, just before dawn. I was seeing the Rebbe for the first time in my life. His face, particularly his eyes, made an unforgettable impression on me. My father held out a note, as was customary, listing my name, the bride's name, and a request for a blessing. The Rebbe took the note from my father's hand and, before unfolding it, smiled at him and said, "It has not even been twenty years since you came here before your wedding. I am sure you recall that my father-in-law sent you to me." Father was amazed by the Rebbe's attention and his astonishing memory. At that moment, the secretary knocked on the door to remind us that we should hurry up. The Rebbe, however, gestured as if to say "Never mind," and then unfolded the note. After reading it, the Rebbe immedi­ately gave his blessing - first to me, then to my father ­wishing us long and happy lives. "As you rejoiced at my wedding," added the Rebbe, "so may the Almighty grant you the happiness of rejoicing at the weddings of your grandchildren." The Rebbe's words moved my father to tears. Before we left the study, my father gathered his courage and in­quired whether he could ask the Rebbe an important ques­tion. "Since my father-in-law once directed you to me," smiled the Rebbe, "I am obliged to answer all your ques­tions." My father told the Rebbe that in Toronto, where we were living at the time, he often heard members of the local non-Chassidic community expressing their opinion that the Lubavitcher Chassidim were making a mistake by reaching out to non-religious Jews. "I do not believe rumors and gossip," said my father, "but the things I hear about Lubavitcher Chassidim sow seeds of doubt and conflict in my heart. King David said, 'Do I not hate, Oh G*d, those who hate thee, and do I not strive with those who rise up against thee?' So why do Lubavitcher Chassidim go out of their way to find a com­mon language with those who rebel against the Almighty and the Torah?" My father hastened to add that he had no intention to offend or criticize anyone; all he wanted was to find out the truth so as to tell others afterward. "Tell me," replied the Rebbe, "how would your 'su­per-religious' neighbor react if his own daughter, G*d for­bid, joined bad company and moved away from Judaism? Would he try to persuade her to return to Torah and the commandments, or would he say that 'those who hate G*d will be hated?' Would he claim that since it is forbidden to look for a common language with sinners, he should break off all contact with her?" Without waiting for an answer, the Rebbe continued, "Of course, he could reply with the verse, 'Thou shalt not hide thyself from thine own flesh.' However, we should keep in mind," here the Rebbe's face became very serious ­he even pounded on the table, "that to the Almighty, every Jew is as important as the daughter is to her father! Every Jew is His flesh, from which He cannot hide Himself!" Then the Rebbe gave us a long piercing look, and said, "I should conclude with a blessing. Chassidic commu­nities have a time-honored tradition of celebrating the fifth night of Chanukah as a special holiday. You see, the fact that the fifth night of Chanukah never falls on Shabbat symbolizes great spiritual darkness. The light of the fifth Cha­nukah candle is capable of banishing any darkness. This is the duty of every Jew, wherever he is - whether in Toronto or London. Every Jew is a fragment of G*d above. With the light of his soul, he is capable of lighting the darkest path and reawakening the soul of another Jew - even someone who is far removed from Torah and the commandments." My father was stunned. The entire way home, all he could do was keep repeating three words: "This is incredi­ble! This is incredible!" In the winter of 1979, a few days before Chanukah, we flew to England to attend my younger brother's wedding in London. On the way, I noticed that my father was deep in thought and was apparently troubled by something. I ques­tioned him about it, but he kept silent. Only after persistent attempts on my part did my father finally divulge the reason for his unease. Shortly before our flight, my father had been visited by one of our neighbors - a respected member of the local non-Chassidic community. Literally wracked by sobs, the man cried to my father, "I would have never told anyone what I am about to tell, but I hope you will be able to help in some way. My daughter has run away. I think she had been intending to do so for a long time, but she kept her plans so carefully hidden that her mother and I were totally in the dark. Two weeks ago, the unthinkable happened: she flew to London together with her gentile friend. Since that day," the distraught father continued, "our home has been sunk in mourning, as if in a perpetual Tish'a B'Av. We have relatives in London, but they can do nothing to help - they do not even know where to start looking for my daughter." That was why he had come to my father. "Perhaps, while in London, could you look around? Hopefully the Almighty in His mercy will help. Who knows, perhaps you will succeed in finding our daughter and saving her from disaster." My father was the man's close friend, and he was shocked by the story. Of course, I too could not remain in­different, and began to think of some way I could be of help. We arrived in London and celebrated my brother's wedding, which was a truly joyous occasion. On the first evening after the wedding, my father told the father of the bride about his neighbor's predicament, and asked whether he could give him some advice. The bride's father said that even though he himself could hardly be of help, he did have a friend, a Lubavitcher Chassid, who had rescued Jewish souls on more than one occasion. The Chassid's name was Rabbi Abraham Yitzchak Glick, and he was an emissary of the Lubavitcher Rebbe. If anyone could undertake this diffi­cult task, he was the man to do it. That same evening, my father phoned Rabbi Glick, describing the situation and explaining that there was no time to lose. Without hesitation, Rabbi Glick asked for the phone number of the girl's parents; they might provide some additional details that could help the search. He prom­ised to do whatever he could, and said that as soon as he found something he would immediately contact us. We do not know where he looked and whom he talked to. Ten days later there was a telephone call from Rabbi Glick. He told us he had a pleasant surprise for us. My father hurried off to his house. As he walked into the living room, he saw a weeping girl he recognized immedi­ately. Rabbi Glick had actually managed to locate her and persuade her to go back to her parents. At the entrance to the living room, my father noticed a Chanukah menorah. He took a closer look, and almost fainted! Five Chanukah can­dles were burning with a steady flame. Father stared at the candles as he recalled the words spoken by the Rebbe fifty, thirty and ten years earlier: "The light of the fifth Chanukah candle is capable of banishing any darkness ... The duty of every Jew, wherever he is ­whether in Warsaw or London ... New York or London ... Toronto or London ... is to shed his light even in the deepest darkness ... How would your 'super-religious' neighbor re­act if his own daughter, G*d forbid, joined bad company and moved away from Judaism? To the Almighty, every Jew is as important as the only daughter is to her father!" My father, convinced that after what had transpired it was his spiritual duty to meet with the Rebbe, tried to ar­range for a meeting. In those years it was extremely difficult to obtain an audience with the Rebbe, yet my father did suc­ceed in seeing the Rebbe a year later, in the month of Tishrei. A group of visitors had signed up to meet the Rebbe during the High Holy Days, and my father joined that group. He was so overwhelmed by emotion that he could not utter a word. Finally, after managing to mutter a few sen­tences, father burst into tears. The Rebbe looked at him and said, "My father-in-law has foreseen a great deal..."
The story does not end there. In 1989, on the 14th of Kislev, my eldest son got married. My father passed away after the wedding. The Rebbe's blessing that my father would rejoice at his grandchildren's wedding came true. It came true exactly sixty years after the "Great Wedding" in Warsaw, exactly sixty years after their first meeting. Here is another story, told by an Israeli from Bnei Brak, who, for a number of reasons, chooses not to divulge his name. I was born in Paris forty-five years ago. I was an only child born to parents who were no longer young. Shortly af­ter I was born we moved to Jerusalem. Even when I was a child, I sensed that there was something mysterious about my birth, even though my parents never talked about it. Among my early childhood memories I have a clear recol­lection of a special sense of spirituality, devotion and rever­ence with which my father led the Passover Seder. Father would listen attentively to my every question, and try to an­swer slowly and thoroughly, focusing on the smallest detail. Shortly before my marriage, when I was twenty-four, my father told me that during the war, they had escaped from Poland to Russia. Moving from one place to another, they eventually ended up in Tashkent. The city was a melt­ing pot of refugees, among them a large group of Lubavitcher Chassidim. My father spoke about them with great respect, admiring their selflessness, their willingness to help others, their great determination to provide children with a Jewish education. By the time the war ended, my father had already turned fifty, while my mother was close to forty. They had been married for almost twenty years, yet they still had no children. They relocated to Paris, where they encountered many refugees like themselves, among them those same Lubavitcher Chassidim they had befriended in Tashkent. One day, shortly after my parents arrived in Paris, one of the Chassidim told my father that an honored guest was ex­pected in Paris: Rabbi Menachem Mendel, the son-in-law of Rabbi Yosef Yitzchak Schneerson, the Lubavitcher Rebbe. He was coming from the States to meet his mother, Reb­betzin Chana, who had left Russia, to take her to New York. My father met Rabbi Menachem Mendel on several occasions, during which they discussed Torah issues. "These conversations," my father told me, "gave me great pleasure." Their first meeting took place shortly before Pesach. When Rabbi Menachem Mendel inquired about my father's family, my father tearfully explained that he was childless after twenty years of marriage. Then Rabbi Men­achem Mendel took father's hand in his own and said firmly, "With G*d's help, by next Pesach you will have been able to fulfill the commandment 'Tell it [the Hag­gadah] to your son." I was born nine months later. When my father re­vealed to me the secret of my birth, I realized why Pesach was such a special time for my parents. I got married. I had children. Years went by, and my daughter grew up. It was time to find her a match. Before long, she was betrothed to a yeshiva student from Lake­wood, New Jersey. A few years later, we received the happy news: my daughter was expecting a child. Shortly before Pesach, our entire family flew to Lakewood to help the young couple prepare for Pesach, and to spend the holiday with them. I asked my son-in-law whether he knew when and how I could see the Lubavitcher Rebbe. He told me that one could stand in line to receive a dollar for charity from the Rebbe's hands, and to hear his blessing. That evening, I arranged a trip to New York. On the Sunday before Pesach, as we arrived in Crown Heights and neared "Seven-Seventy," I was amazed to see a line of thousands waiting for their chance to meet the Rebbe. My son and I joined the line. During the five hours in which we patiently waited our turn, I told my son the mi­raculous story of my birth. He was very moved by my story, and told me that now he understood my determination to see the Lubavitcher Rebbe. It was almost five o'clock when we reached the table where the Rebbe was handing out the dollar bills. I could finally see the Rebbe up close. I was deeply impressed by the Rebbe's face, filled with majesty and dignity, and amazed at his alertness despite the many hours of standing on his feet. The line was moving very quickly. I had not planned to say anything; I did not even know what to say. I only wanted to see the Rebbe, and I wanted the Rebbe to see me. Our turn came. My son stood before me. The Rebbe handed him a dollar and said, "Brachah ve'hatzlachah," ("Blessing and success"). Then he asked him in Yiddish, "Are you ready to ask the Four Questions?" (referring to the four questions children traditionally ask during the Seder). My son replied, "Yes, I am." 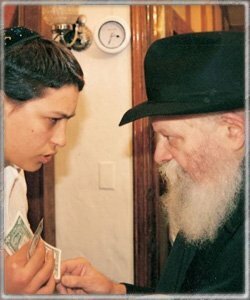 The Rebbe smiled and handed him another dollar. "This is for the Four Questions," he said. Suddenly he gave me a penetrating look, smiled, and said, "And for the commandment of 'Tell it to your son ... '"
I have absolutely no recollection of what happened later. All I know is that I regained my senses when I was al­ready outside. I was brimming with feelings. Later I was told that I had remained frozen in front of the Rebbe until I was ushered out of the building. Rabbi Chaim Gutnick tells this next story. A wealthy family - mother, father and daughter ­lived in Ballarat, near Melbourne, Australia. The parents loved the daughter dearly, and never refused her anything. She attended university, where she excelled in her studies; every Sunday, like many girls her age, she visited the local Catholic convent. One day, in the municipal library, the girl stumbled across a book in a black cover containing photographs of famished, despondent human beings. The girl started read­ing the book, and discovered something hitherto unknown to her - the Holocaust and its six million Jewish victims. She read with increasing incredulity and shock. "Can it be," she kept asking herself, "that human beings are capable of such brutality?" She took the book home, where she read it over and over again, and each chapter stunned and horrified her. Anguish and pity for the remote and unfamiliar Jewish people filled her heart and mind. She was tormented by dis­turbing emotions, thinking day and night about what she had read. Her parents noticed the change that had come over their daughter. Unable to help her, they took her to a doctor. "A strange form of mental disorder," was the diagnosis. "There is no medicine for what ails your daughter." The parents heard the doctor's opinion without uttering a word. One day the girl saw an article about the Lubavitcher Rebbe in a local newspaper. The article described the Rebbe as the leader of the people of Israel, whose counsel and blessing are sought by people from every comer of the world. The girl decided to write a letter to the Rebbe. In the letter she wrote that, despite being a devout Christian, she felt profound sympathy for the Jewish people, who had suf­fered so terribly during the Second World War. She also de­scribed the attraction she felt to the Jewish people, and the way these thoughts and emotions had affected her mental state. She concluded by asking whether the Rebbe could help her come to terms with these feelings. The Rebbe's reply was not long in coming: "Talk to Rabbi Chaim Gutnick." Rabbi Gutnick's activities were well known through­out Australia, and finding him was easy. The first religious Jew the girl asked knew Rabbi Gutnick's whereabouts and told her how to get there. When the girl arrived in Melbourne and approached the rabbi's house, she suddenly began to have second thoughts about her actions. "Will he receive me? Does he know about me? Has he spoken to the Lubavitcher Rebbe? Will he even want to talk to me when he finds out that I am Christian?" These and other questions kept running through her head. Suddenly a man opened the door to the house. "Are you looking for someone?" he inquired. The girl explained that she was trying to find Rabbi Chaim Gutnick, and that she urgently needed to talk to him. Rabbi Gutnick smiled and invited her in. He listened to the girl's story, read the Rebbe's reply, paused to consider the matter, and then asked a few ques­tions about her parents, where they were from, and their oc­cupations. The picture remained as hazy as ever. When the girl left the rabbi's house, she was even more confused and disoriented than before. Several days later, Rabbi Gutnick received a letter from the Rebbe regarding an earlier correspondence, but the postscript at the end struck his eye: "Whatever happened with the Jewish girl from Ballarat?" Rabbi Gutnick was stunned. After rereading the letter and failing to discern any hidden meaning in the Rebbe's words, Rabbi Gutnick im­mediately got ready for a trip to investigate the matter. Arriving in Ballarat, Rabbi Gutnick located the girl's house and rang the doorbell. The parents were surprised by this unexpected visit. "This is strange," said the surprised father after listen­ing to the rabbi's story. "Very strange. We belong to the Catholic Church and have no connection to Judaism. Our daughter is obsessed by a crazy idea. This is very troubling, but what can we do?" This ended the conversation. Rabbi Gutnick returned to Melbourne, but the Rebbe's words kept running through his mind. Several more days went by. Rabbi Gutnick, who had continued his inquiries about the girl's family, found out that the girl had been hospitalized. Her condition was quickly deteriorating, and in the doctors' opinion, she did not have much longer to live. Before setting out for Ballarat once again, Rabbi Gut­nick asked his friend Rabbi Zalman Serebryanski, dean of the Lubavitch Rabbinical College in Melbourne, to accom­pany him. Rabbi Serebryanski was astounded. "What?" he exclaimed. "You want me, an old Jew, to visit some Catho­lic girl?" Rabbi Gutnick silently showed him the Rebbe's letter, and Rabbi Serebryanski immediately changed his mind. When they came to the hospital, the girl's parents were already there. The parents greeted the two rabbis very warmly. During the ensuing conversation, the girl's mother suddenly told Rabbi Gutnick that she wished to speak to him in private. "At that moment," Rabbi Gutnick would recount later, "I knew that the mystery was about to be cleared up." Out in the corridor, the mother said that were it not for her daughter's condition, she would never reveal her se­cret. Then she burst into tears and told her story. She had been raised in an Orthodox Jewish home in England. As a young girl, she had ran away from home and moved to Aus­tralia, where she abandoned Judaism entirely, converted to Catholicism, and married a Catholic. "I love my daughter," she concluded, "and I will not stand in her way if she decides to return to Judaism." "You must tell all this to your daughter!" exclaimed Rabbi Gutnick. "Immediately! This may very well save her life!" "I will talk to him myself," said Rabbi Gutnick. He told the woman to send her husband out to the corridor and to stay in the room with her daughter. After their conversation, when the girl's father, ac­companied by Rabbi Gutnick, walked back into the hospital room, he saw his daughter packing her belongings. Her eyes were shining. "Let's go home!" she said to her father. "I feel wonderful!" Rabbis Gutnick and Serebryanski helped the girl inte­grate into Melbourne's Lubavitch community, where she was able to receive a Jewish education. Today she is a teacher in a Lubavitch school, and her children are attending a Tomchei Temimim yeshiva. However, Rabbi Gutnick was still bothered by that postscript in the Rebbe's letter. At his next meeting with the Rebbe, he mustered his courage to ask the Rebbe how he had known that the girl was Jewish. The Rebbe replied with a smile: "The letter that she sent me could only have been written by a Jewish girl." Rabbi David Shoichet from Toronto tells this last story. "In 1978, I was invited to give a lecture entitled 'The commandment of charity and its relationship to the festival of Purim,' at a conference of Christian priests and monks, to be held in Buffalo. I was at a loss whether to accept the invi­tation. How would Jews and gentiles react to an Orthodox rabbi appearing at an official forum of Christian priests? On the other hand, if I declined the offer, would it cause even greater harm by presenting Judaism in a negative light? "From what I understand," I replied, "I am expected to simply deliver a lecture about Judaism's position on char­ity. I don't believe that the conference will include debates and religious discussions." "Shortly, Rabbi Hodakov phoned again to inform me of the Rebbe's advice: I was to accept the invitation to de­liver my lecture at the conference. Since Jews would also participate in the conference, it was preferable that they hear a lecture based on the genuine Jewish approach to the issue from an Orthodox rabbi. "I felt as if a huge stone had rolled off my heart. The Rebbe had not only dispelled all my misgivings, but also provided me with a clear plan of action. I had a feeling that the Rebbe stood behind me, guiding and encouraging me, and this filled me with joy and inspiration." This is the story that the Rebbe was referring to. At the very edge of the Prague ghetto stood a luxurious house that belonged to Pinchas, the richest man in the community. However, the opulence of the house inspired hatred rather than admiration; passing the house, people would turn away and clench their fists. It seemed that they had a good reason for doing so. No one was sure how this rich man had come by his wealth. However, the entire city knew that if a poor man or someone collecting donations for the needy knocked on the door of his house, he was in­variably met with a cold, indifferent look and a harsh refusal. A petitioner could expect nothing but humilia­tion there. The entire city called the owner of this mansion a miser. Whenever someone said the word "miser," everyone knew that he was taking about Pin­chas the rich man. When Pinchas died, the city's residents could not hide their joy. "Did you hear the news?" people asked one another in synagogues, in the markets and in the streets. "Pinchas has died. That miser is dead, gone to the next world, leaving all his money here! They say that he will come back one day to take it with him." Pinchas the miser was buried next to the fence of the old cemetery, among all sorts of disreputable individuals, as far away as possible from those poor Jews who had died because he had refused to help them. Barely a week after the death of Pinchas the mi­ser, Rabbi Yom Tov Lipman, the chief rabbi of Pra­gue, was besieged by the needy. People who had managed to sustain their families for years, now stood before the city's rabbi with lowered heads. "It has been days since we had any food to give our chil­dren ... We are on the brink of starvation..."
"How did you manage to survive until now? What happened during the last few days?" asked Rabbi Lipman in surprise. "Praise G*d, we managed somehow. The shop­keepers would sell to us on credit and never remind us about repaying our debts. The butchers, fishmongers and bakers too. In the last few days, none of them is willing to sell on credit. Everyone is demanding that we pay on the spot, and in cash." The rabbi summoned the shopkeepers, butchers, fishmongers and bakers. "What has changed over these last few days? Why have you stopped selling to the needy on credit?" The merchants cast down their eyes and kept silent. "I order you to tell me the truth, the entire truth!" shouted the rabbi, who rarely raised his voice. "Our esteemed rabbi, may the Lord grant him a long life," began a shopkeeper by the name of Meir. "We are not to blame. We were not the ones ... "Meir sadly hung his head, shifting from one foot to the other. "It was... Pinchas the miser. Every Sunday, he would come in and payoff the debts of the poor. His money was behind it all, but he made us swear that we would never reveal this secret. .. It is only because our esteemed rabbi, may the Almighty bless him, has or­dered us that we..."
Silence fell on the room. Rabbi Yom Tov Lip­man turned pale; his hands were visibly shaking. He became lost in deep thought. The merchants, careful not to make any noise, quickly filed out of the room and dispersed in silence. As soon as they left, others came in - those in charge of the community's charitable institutions, col­lecting dowry money for needy brides, taking care of widows and orphans, organizing funerals for the poor, and assisting the sick. Even before they opened their mouths to speak, Rabbi Lipman silently nodded and gave them an understanding look. "The cashbox is empty," whispered Rabbi Yitz­chak, who was responsible for charitable work in the community. "There is no money left, not even for ba­sic necessities like firewood... and winter is almost here." These people, responsible for providing aid for the needy, quickly realized that nothing would be the same again - now that Pinch as the miser had died. Rabbi Yom Tov Lipman convened a large meeting. A huge crowd, almost the entire community, filled the synagogue, looking up at the rabbi with a question in their eyes. "Now we all know the truth," said Rabbi Lip­man. "Rav Pinchas, the tzaddik, has left the world, leaving hundreds of destitute families without their generous benefactor. Only now, after his death, have we become aware of his charitable deeds, or rather a fraction of his charitable deeds." The rabbi burst into loud sobs. Then he controlled his feelings and contin­ued. "Why didn't we realize that we had a tzaddik in our midst? How could we have treated him with such contempt? We have committed grave sins against this man, both when he was alive and after his death." The people filling the synagogue wept. After the meeting, Rabbi Lipman summoned the members of the burial society, and asked them to bury him - when his time came - next to the righteous Rav Pinchas. "I know that many people will wish to be buried next to me, and thus the area next to the fence will become the most prestigious section of the cemetery. In this way, we shall honor Rav Pinchas, the tzaddik." "So," continued Rabbi Shoichet, "I attended the con­ference in Buffalo. The enormous auditorium was com­pletely quiet. Hundreds of Christian priests and monks lis­tened to my story - the story about Jewish charity - with in­tense concentration. When I finished, the audience burst into thunderous applause. It was as if the listeners had been sud­denly transported from the old Jewish cemetery in Prague back to the present reality. "After the lecture, a young monk approached me. His smooth, well-eared-for face contrasted sharply with the guarded look in his eyes. Glancing around, he asked me in a hushed voice when the story I had just related took place. I told him that it happened about three and a half centuries ago. In agitation, the monk thanked me and returned to his seat. "Assuming that he had missed certain details, I retold the story. The monk listened very carefully and appeared quite excited. When I finished, he asked me to tell the story once again. I began to suspect that he was not completely in his right mind. "Now I was almost sure that this young man was mentally deranged. However, a moment later he began to tell his story." At the beginning of World War II, after the Germans had invaded Poland, somehow my mother managed to escape the inferno. She made it to Am­sterdam, where she married a gentile, a Catholic. I was brought up in a devout Catholic home, and had no inkling that my mother was Jewish. My parents sent me to boarding school in a monastery, where I spent many years. Later, I became a pastor in a local Catholic church. Mother told me her life story only a short time before her death. "I am a Jew," she said. "I swore to your father that I would never tell you this, but now I feel that it is my duty to do so. According to Jewish laws, the son of a Jewish mother is a Jew. That makes you a Jew." Mother told me about our family history, men­tioning that we descended from a very rich man who had been renowned for his charitable deeds and the help he had provided for many years to the poor in his town. "In acknowledgement of his virtue," my mother added, "a sage, the former rabbi of Prague, was buried next to his grave." A few days later, my mother passed away. I re­turned to my daily routine and put her story out of my mind. When I was invited to this conference, I saw that a rabbi was scheduled to deliver a lecture present­ing the Jewish viewpoint on charity. I thought to my­self, "What can he possibly say about charity? After all, everyone already knows that helping the needy is important and commendable." However, the lecturer - you, that is - presented a completely new aspect of this subject - secret char­ity. I must admit that you have done it with great competence. Your lecture has given me a chance to peek into another world. As to your tale of the rich man and the rabbi, I do believe that this rich man is my ancestor. "The story told by the young monk left me aston­ished, unable to decide how much of it was true and how much fantasy. Soon after my return from the conference, I forgot all about that encounter. "Seven years later, in 1985, I happened to be visiting Israel. While in Jerusalem, naturally I went to the Wailing Wall. As I was about to leave, a Chassid came up to me. A small beard framed his refined features. 'Good evening, Rabbi Shoichet!' the stranger said. I was peering into his face in a vain attempt to remember who he was. "I beg your pardon," I finally said, "but I cannot place you. Have we met before?" "Of course you cannot place me," replied the Chassid. "The last time we spoke, I looked very different." "I felt a shiver down my spine. Had I heard him right? I took a closer look at the man - and the features of the young monk began to show through his face. Yes, it was the same man, no doubt about it. "I was struck speechless. Suddenly feeling weak, I sat down. The Chassid was crumpling a handkerchief in his hand. After a minute's silence, he began to speak..."
As you may recall, my mother, before she died, had admitted her Jewish identity to me. However, many years went by without my attaching any signifi­cance to my Jewish origins. I was living my former life, and would have probably continued to do so if not for the conference where you gave that lecture about "secret charity" and the rich man from Prague. As soon as you began your story, I knew it sounded familiar, but the reason escaped me. At the time, I thought it might have been something I had read in a book. The more the story progressed, the more famil­iar it got. I was ransacking my memory, trying to grasp the vague recollection associated with the story. Those were difficult moments for me - very difficult moments. I sensed that the story had some powerful and elusive connection to my own life. There was a moment when I thought my head was about to burst. Suddenly, in an instant, the fog cleared - I remembered everything! The protagonist of your story was that same famous and venerated ancestor mentioned by my mother before her death. My heart had become a jumble of recollections coming to the surface. The many questions that had plagued me for years suddenly found their answers. When my mother had disclosed my Jewish origins to me, I had not attached any importance to that fact. However, your story made it patently clear to me that I was part of the Jewish people. I was very anxious and felt compelled to come to your hotel and hear the story once again. To make doubly sure that there was no misunderstanding, I approached you to clarify some details in the story; perhaps they would jog my memory. After that conference, I knew no rest. I began to study everything that had any connection to your story: the history of Prague's Jewish community, bi­ographies of the city's rabbi and of the rich man next to whose grave he was buried. After investing a great deal of effort, I traveled to Prague, and there, in the old Jewish cemetery, I located, after a long search, the grave site of Rabbi Yom Tov Lipman Heller, which was adjacent to the grave of my ancestor. Upon my return, I packed my belongings and moved to another city where no one knew me. There I embarked on serious study of the Jewish religion, laws and customs. Some time later, I came to Israel, abandoned my former way of life, and began to keep the Torah and the commandments - adopting the Chassidic lifestyle, as you can see. Rabbi Shoichet concludes his story, "I was astonished at the mysterious workings of Divine Providence. Later, an­other piece was added to the puzzle when I found out that I am a descendant of Rabbi Yom Tov Lipman Heller! Heaven must have wanted to arrange destiny so that a descendant of Rabbi Lipman brought a descendant of Pinchas the benefac­tor back to the Jewish people." All that remains is to be amazed at the way the Lubavitcher Rebbe had foreseen this turn of events! After all, he had obviously known that a Jew clad in a monk's black cassock would be present at the conference - and that the story about "secret charity" would be the catalyst that would bring that Jewish monk back to the Jewish people.